The freshly renovated, 5-star International Hotel Casino & Tower Suites is situated in Golden Sands resort, only 90 meters from the beach and 17 km from Varna city center. The property features a mix of 325 standard, superior rooms and suites, with stunning park and sea views. All rooms feature king size or twin bed, stylish bathroom with bath tub or shower, hair dryer and magnifying mirror, bathrobes & slippers, individually controlled air- conditioning, direct telephone line, mini bar, safety box, 32-inch LCD TV, cable television, including variety of international programs, night turn down service, bedside night lamps & electricity sockets. All superior rooms feature private balcony. • A-La-Carte Steak House features the finest cuts of meat, sourced from local European farms and paired perfectly with a distinct selection of wines and accompaniments. • Restaurant International offers a variety of fresh salads, freshly prepared dishes, fruits and desserts. Capacity - 350 seats. • Restaurant High Limit is positioned on the third floor of the stylish and unique Skyfall zone. • The Skyfall Zone is known for having the best views in the resort. With a stunning panorama of the coast, at the backdrop of the Skyfall infinity pool, it is the ideal venue for relaxation. • Replay Bar is a night club with varied music. • Casino Lounge Bar offers a bright, beach-style casino experience throughout the day, transformed into a swanky scene by evening. • Lobby Bar Le Cafe - a bright and very elegant atmosphere with extra-comfortable lounge-style seating. It is the perfect spot for a relaxing morning coffee, afternoon snack or refreshing cocktail in the evening, 24 hours a day. Experience the highest level of comfort from the highest peak during your stay at the hotel. This new addition to the hotel caters to the most discerning clients, offering unparalleled privacy, exclusivity and comfort. Enjoy privileges, such as all-day dining, VIP service and the ability to tuck away into an intimate setting, for business or for pleasure. The zone can be accessed by players club members with Executive status and limited number of guests with card access to the Executive lounge. The spa centre offers over 160 specially curated spa treatments and exotic beauty products. The “I-SPA” Center offers additional facilities including, indoor pool, steam bath, Turkish bath, infrared sauna, Finnish sauna, hydro-massage room, fitness room and a beauty salon. 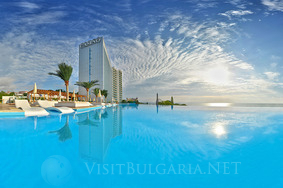 Annually the hotel hosts more than a hundred events of all types and sizes, from 20 to 1500 pax. With capacity for up to 1,200 people, a variety of 8 meeting rooms, as well as a Ballroom and Amphitheater, this makes International Hotel Casino & Tower Suites the biggest hotel-based conference center in Eastern Bulgaria.